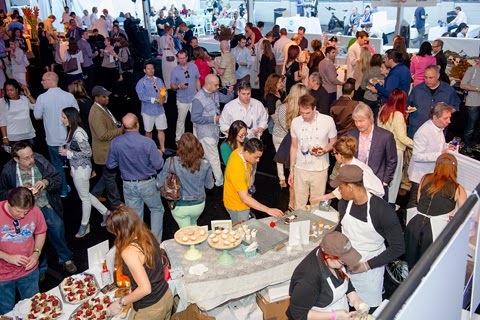 An outstanding list of restaurants and chefs will participate in the 8th annual event taking place on Wednesday May 27th, Friday May 29th & Saturday May 30th. NBC's Adam Richman will host "Comfort Classics" on Friday, May 29th and Food Network's Marc Murphy & Anne Burrell will host "Best of the West" on Saturday, May 30th. Highlights include Momofuku Milk Bar, Bar Boulud, Boulud Sud, Parm, RedFarm, The Meatball Shop, Sarabeth's, The Mermaid Inn, Luke's Lobster, Gotham West Market's Genuine Roadside, Magnolia Bakery, Shake Shack, Rosa Mexicano, Tavern on the Green, Dovetail, The Ribbon and many more! For more information and to purchase tickets, please visit http://www.newtasteuws.com. The festivities begin with Soirée in the Park on Wednesday, May 27th, an outdoor cocktail event that celebrates and raises funds for New York City’s beautiful Theodore Roosevelt Park, surrounding the American Museum of Natural History. Guests enjoy live chamber music under the stars with champagne and hors d’oeuvres provided by a host of local restaurants including Sarabeth’s and Luke’s Lobster. The culmination of this star-packed three-day food festival is Best of the West on Saturday, May 30th, where many of the Upper West Side’s most famous restaurants and celebrity chefs are the focus of an evening centered around spectacular cuisine, world-class wines and enticing cocktails, buoyed by the 16-piece rhythms of Joe Battaglia & The New York Big Band. The celebratory event will be hosted this year by Anne Burrell, host of Food Network’s Worst Cooks in America, and Marc Murphy, owner and executive chef of Benchmarc Restaurants (Landmarc and Ditch Plains), executive chef of Kingside and popular judge of Food Network’s Chopped. NYFW For Fall '15: Favorite Shows and Parties!